Choose your fighter and master your martial arts in this competitive fighting video game by Capcom - Street Fighter 2 Turbo: Hyper Fighting! 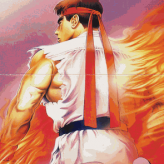 As the third game in the Street Fighter II sub-series, the game features faster gameplay, faster animation, and lots of new special moves for the characters, as well further enhancement to character balance. Street Fighter 2 Turbo: Hyper Fighting is the final game to use the original CP system hardware before the entire series moved on the next. This Super Nintendo Entertainment System version also contains the Champion Edition versions and upgrade in its "Normal mode". The game features dozens of cheat codes that affect the game and unlock various features like faster settings, and so much more. Street Fighter 2 Turbo: Hyper Fighting is an online SNES game that you can play at Emulator Online. This free Super Nintendo game is the United States of America region version for the USA. Street Fighter 2 Turbo: Hyper Fighting is a single title from the many skill games, arcade games and street fighter games offered for this console. If you enjoyed playing this, then you can find similar games in the snes games category. Street Fighter 2 Turbo: Hyper Fighting game is from the various retro games on the site, and there are more games like this, including Street Fighter 5, Super Street Fighter II Turbo: Revival and Dragon Ball Z: Hyper Dimension.